According to a report from Beloit University, rear-end accidents are the second-leading cause of motor vehicle collisions in the United States. These types of crashes account for about 28 percent of all motor vehicle accidents on U.S. roadways. 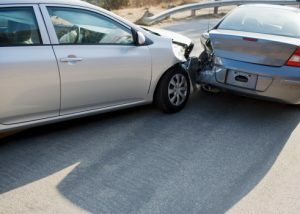 A rear-end accident lawyer knows that drivers in Portland, Hillsboro, and Gresham can try to prevent such collisions by making smart choices about their own behavior and by paying careful attention to what other motorists are doing on the road. Following a lead car too closely is the second most common cause of rear-end accidents. Distracted driving is the most common cause. The National Highway Traffic Safety Administration indicates that those two motorist behaviors are the cause of 93 percent of all rear-end driving collisions. Leave enough space between your car and a car in front of you when you come to a stop. Don’t pull right up behind another car at an intersection or signal because then you won’t have any escape route if a car is barreling towards you and doesn’t look like it is going to stop. You should also look around to see if the road shoulder or an empty lane would provide an acceptable escape route if another driver is about to hit your car. Make smart choices when other drivers are behaving in an unsafe way. Check your mirrors often (around once every five to eight seconds) to see if the driver behind you is paying attention and aware of what you are doing. If another driver is tailgating behind you, try to get out of the way and let them pass rather than hitting the brakes or slowing down to try to get them to stop. You could just create a dangerous situation where your vehicle is likely to get hit. Keep your brake lights working. You want other drivers to know what you are planning to do, and a simple fuse problem or burned out bulb in a brake light could create a really dangerous situation. Know how to respond if another driver strikes the rear of your vehicle. The natural instinct in these situations is for you to just hit the brakes harder on your own car. Usually, this makes the accident worse or at a minimum it does nothing to lessen the impact. If you have an escape route, then you should instead steer the car in the direction where you want it to go and accelerate when you are struck from the back. These are just a few of many possible ways that drivers can try to prevent rear-end accidents or reduce the severity of these types of crashes. Drivers need to make responsible choices and do everything they can to stay safe on the roads.